This year Penn Manor’s trying something they haven’t done in two years, putting on a non-musical play. “Check Please” is described as a romantic-comedy by assistant director, Melissa Mintzer. “We saw the first act at our state conference.” said Carole Shellenberger, the experienced director and former long-time Penn Manor English teacher. The play was originally written by Johnathan Rand and was meant to be a one-act play but now, under the direction of Shellenberger,has been stretched into three acts. 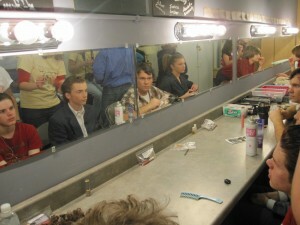 Cast Members of "Check Please" get made up, during dress rehearsal. Assisting Shellenberger and Mintzer is Mark Dennis, the tech director, and Rebecca Cotich, the costume coordinator. The three-act play circles around the story of two single people, “Guy” played by veteran high school actor, Nate Lussier, and “Girl” played by the experienced high school actress, Dessie Jackson. The couple go on a series of blind dates to find the right person, but instead they find an array of strange characters. “Unique show, these are the blind dates you would never want to be on.” Lussier says. Dana Landis, the stage manger and her assistant Traci Harkins, are two key characters behind the scenes. But one thing they didn’t have a problem with was the comedy. “I wouldn’t say there’s one or two funny characters,” said Landis, referring to the natural comedic abilities of the entire cast. “The acting was all natural reactions for me,” told Jackson.